Advisors who dont help their clients claim Social Security are leaving money on the table and may face liability issues. Advisors who don't help clients with Social Security claiming strategies are missing out on opportunities to serve them better — and might one day face legal repercussions. Many advisors would agree that helping clients optimize their Social Security benefits is an integral part of retirement income planning, but a surprising number of advisors have not latched on to this important trend. Advisors who fail to incorporate — and become educated on — the myriad Social Security claiming strategies are not only at risk of losing clients, but they’re also putting clients’ retirement security in jeopardy, which could land them in legal hot water. Actions to rein in entitlement programs by the GOP-controlled Congress could further obscure the already complicated process of optimizing clients’ Social Security benefits. 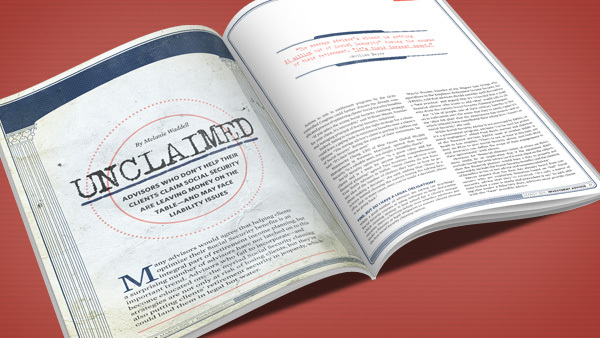 “If you select the wrong Social Security claiming strategy for your client, it’s irrevocable,” said William Meyer, founder and managing principal of Social Security Solutions. Fine, but Do I Have a Legal Obligation? While a good number of advisors are taking (or teaching) Social Security courses or using software to help determine which claiming strategy is best suited for a client’s unique situation, there’s a brewing debate over whether advisors are under a fiduciary or legal obligation to ensure clients choose the best Social Security claiming option. Marcia Wagner, founder of the Wagner Law Group, who specializes in the Employee Retirement Income Security Act (ERISA), said that advisors should consider such discussions a “best practice,” and argued that it’s “expected that a good financial advisor who wants to add value” would talk to clients about the various Social Security claiming techniques. For “a lot of people, one of their primary benefits to live on in retirement isn’t the assets that they’ve saved; rather it’s the ‘uber DB plan’ that the government has created—and to which [clients] have contributed their whole lives—known as Social Security,” she said. While Social Security advice is not governed by ERISA, as it’s a government program, advisors “can be sued for professional negligence,” added Fred Reish, partner and chairman of the financial services ERISA team at Drinker Biddle & Reath in Los Angeles. “There is not, at least at this time, any duty on RIAs to give Social Security advice. And both RIAs and attorneys can define the scope of their engagements in their agreements” with clients. Meyer argued that his firm has already heard from consumers who are exploring litigation based on “bad” Social Security advice that they’ve received. “It’s only a matter of time before a case is made and precedent is set,” he said, adding that under a fiduciary duty, advisors must provide clients with the “best” possible advice. “If an advisor has a contract with a plan sponsor or participant that says the professional advice they give is fiduciary in nature and it includes looking at sources of income, including Social Security,” Saxon said, “then I would submit it would be very difficult for you to wiggle out of that obligation.” So, Saxon warned, advisors should “be careful about having open-ended, generic statements” in their agreements. So how are advisors helping clients decide which claiming strategy best meets their needs? As Meyer explained, picking the optimal Social Security claiming route is “really a complicated decision,” and the “number of rules and exceptions [is] daunting.” Advisors “really have to be careful,” as Social Security claiming strategies are dependent on different variables such as life expectancy, household type or whether clients work part-time. Then there are rules for receiving disability benefits (see sidebar, “The Third Rail of American Politics Is Live“), as well as rules for those of retirement age who have young children. Different claiming strategies are based on household type—single, married or widowed. Also, “if one person has already started taking benefits, what should the other person do?” Meyer said that “happens a lot with married couples.” Different rules also exist for those who’ve worked in the government or have been a teacher, called the non-covered pension, he said. Meyer said that while advisors know Social Security optimization “makes a difference, in some cases hundreds of thousands of dollars,” what they have yet to master is coordinating Social Security with a client’s withdrawal strategy (see sidebar, “While Waiting for SS Benefits, Whither Retirement Income?“). Most retirees—anywhere from 70% to 80%—claim benefits early, at age 62, which most advisors say should be avoided. When taking benefits before your full retirement age of either 66 or 67, depending on when you were born, your benefit is reduced by 25%, said Scottino. If you delay your benefits and take them after 66, she explained, the benefit grows inflation-adjusted about 8% per year between ages 66 and 70. According to the Social Security Administration, if a person starts retirement benefits at age 62, their monthly benefit amount is reduced by about 30% below what they would receive if they started benefits at full retirement age. If they start benefits at age 63, benefits are reduced by about 25%; 64, about 20%; 65, about 13.3%; and 66, about 6.7%. For those who start receiving a spouse’s benefits at age 62, their monthly benefit amount is reduced to about 32.5% of the amount their spouse would receive if his or her benefits started at full retirement age. Regardless of the situation, for married or divorced couples, and widows or widowers, “the value comes from waiting longer,” agreed David Mendels, director of planning at Creative Financial Concepts in New York. “For most people, [delaying taking benefits] makes a huge difference because [Social Security is] a safety net; even for relatively wealthy clients [it's] still a very significant part of their retirement” income. Couples have “many more options” than single people, said Victoria Fillet, principal at Blueprint Financial Planning in Hoboken, New Jersey. “If you’re single, you have three options: take reduced benefits at the age of 62, take full retirement benefits at 66 or delay benefits until age 70, but even if you’re single at full retirement age, you should file and suspend.” That means going to the Social Security office and stating that you’re of full retirement age, but that you’re not going to start taking benefits until later. If something changes, Fillet said you can go back six months after you suspend. Say you’re single and decide to wait until 70 to collect benefits, but six months later you’re diagnosed with terminal cancer and you need to collect benefits due to your illness, Fillet explained. If you had done a file-and-suspend, the Social Security Administration “would go back six months” on the benefits you receive, meaning you’d get retroactive payments. A file-and-suspend strategy also “opens up the benefit for people who are already on your record. Sometimes that’s your spouse, other dependents or children,” planner Scottino said. She recalled a claiming strategy in which she “dug deeper” to help a widower. In this instance, the husband claimed under the spousal benefit and started receiving his deceased wife’s Social Security payout, which was between $900 and $1,000 per month, but he kept working until age 70. Working until 70 allowed his benefits to grow, and once he reached 70, “we flipped him over” to his full benefit, which was $2,000 per month. “Basically the $1,000 was free [money] while his [benefit] grew 8% per year for the last four years,” she said. Like other advisors, Lee said Spectrum uses a software program to help demonstrate the various claiming options. BlackRock has a Social Security calculator and MoneyGuidePro offers a module on Social Security claiming strategies. But Meyer argued that Social Security Solutions’ SSAnalyzer tool, which the company developed over three years and then patented, provides the only true “optimization” tool. “We have a who’s who of institutions using this software,” he said, adding that advisors who use SSAnalyzer software can private-label it. While Waiting for SS Benefits, Whither Retirement Income?